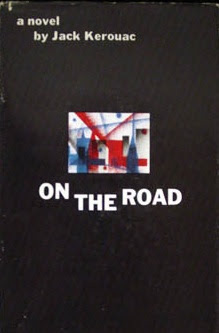 Bookride: On the Road. Jack Kerouac, 1957. Jack Kerouac. ON THE ROAD. Viking, New York, 1957.
" Very nice copy of this rare TRUE 1st printing from one of Americas greatest writers! Book and jacket look terrific; with brilliant ink colors... A wonderful gem for any collection! One of the nicest FIRST EDITION books in the world!" The great hip beat bible now reduced to --'One of the nicest books in the world!' Sic transit gloria mundi. VALUE? A very desirable book signed, especially if signed to someone close or important. At the 2002 Rechler sale a copy inscribed to Joyce Johnson with an autograph letter made $160K, another copy inscribed to William Targ in 2004 made $55K (d/w was rubbed, as is common with this book.) Lesser signed copies around $20K,but they are uncommon- he never did bookshop signings and when the book was a hit was so overwhelmed by the publicity that he went into self-imposed exile with his mother. "Once voted Shagger of the Year by readers of The Sun, Russell Brand is looking to gain some intellectual kudos with his new programme for the BBC. The crazy-haired, make-up wearing lothario is going to take to the roads of America with his Radio 2 colleague, Matt Morgan, as homage to the great beatnik writer Jack Kerouac. Kerouac’s classic On The Road celebrates its 50th anniversary this year, and so as a huge fan of the work, Brand will retrace Kerouac’s journey. Kerouac in his later years became a serious drunk and died aged 47 from cirrhosis of the liver. It is said that he used, whilst 'off his face', to visit local bordellos and pay hookers to read from his works while he whacked off. It has the ring of truth. As mentioned Kerouac became very reactionary and patriotic - many of his collectors are in no way wiggy old beats, but include Hollywood actors, entrepreneurs, bland corporate types or even crazy completists who hunt down every offprint and salesman's dummy. Beats, beatniks and hipsters (now in their dotage) occasionally turn up at Shakespeare and Co in Paris so I have been able to observe them at first hand - they are generally a tiresome, unenlightened and self centred bunch. Gary Snyder and the Brit Alan Watts excepted.